Anyone who picks off a Jameis Winston pass better watch out for Florida State tight end Nick O’Leary. Louisville linebacker James Burgess was able to intercept a Winston pass in the second quarter of Thursday night’s game. 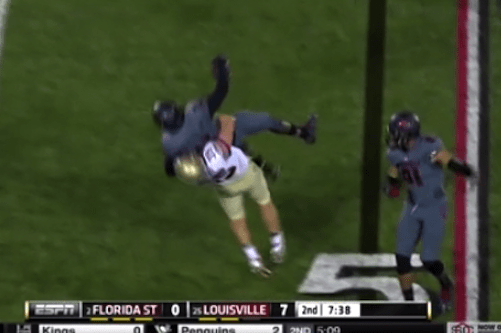 After dragging O’Leary with him for a few yards, the Seminoles tight end gained his footing and slammed Burgess to the ground. The Cardinals were able to capitalize on the interception, however. They scored a touchdown on the ensuing drive to take a 14-0 lead.